1997's New Year stamp is the fifth in a 12-year series based on the symbolic animals of the Chinese Zodiac. The series began in 1993 with the Year of the Rooster, and will end in 2004 with the Year of the Monkey. According to Chinese astrology, people born under this sign are trustworthy, dependable, and blessed with a strong sense of integrity. Known as Yuan Tan, the Chinese New Year is celebrated by Chinese people throughout the world, including Chinese Americans. Always on the first day of the first month of the year, the new year is determined by the Chinese lunar calendar, and falls between January 21 and February 19. Festivities last for fifteen days. Before New Year’s Day, families clean the house and put up decorations. Since red is considered a lucky color, red flowers are used to decorate with, and red scrolls wish everyone happiness and prosperity. On New Year’s Day businesses close and families gather together to celebrate. Special foods are prepared and firecrackers are used to scare away evil spirits. The day ends with the Lantern Festival. Carrying paper lanterns through the streets, well-wishers shout Gung-Hey-Fat-Choy – Happy New Year! Clowns, musicians, and dancers join the parade. And of course, there is always a dragon, the symbol of strength and good luck. 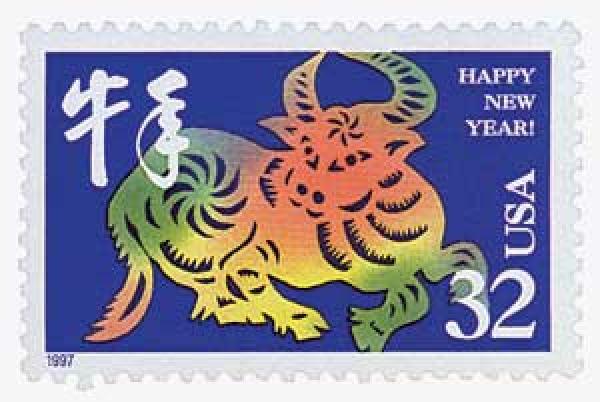 This year’s New Year stamp, the fifth in the series, celebrates the Year of the Ox. Individuals born during this year are trustworthy, dependable, and conscientious. Known to have strong ideas, they are also said to be stubborn and jealous. Through hard work and fortitude however, they are likely to prosper.